Why are customers buying new access points (APs)? Sixty-five percent of our survey's respondents said they are looking to expand WLAN coverage with their access point purchases. In the past, organizations may have been satisfied with having WLAN coverage for specific areas of a building or facility -- a conference room, for instance -- but as the client base for wireless devices increases, "you have to then increase the amount of wireless access points and tune your wireless network to support those devices," said Ramon Thomas, pre-sales engineer at Force 3. 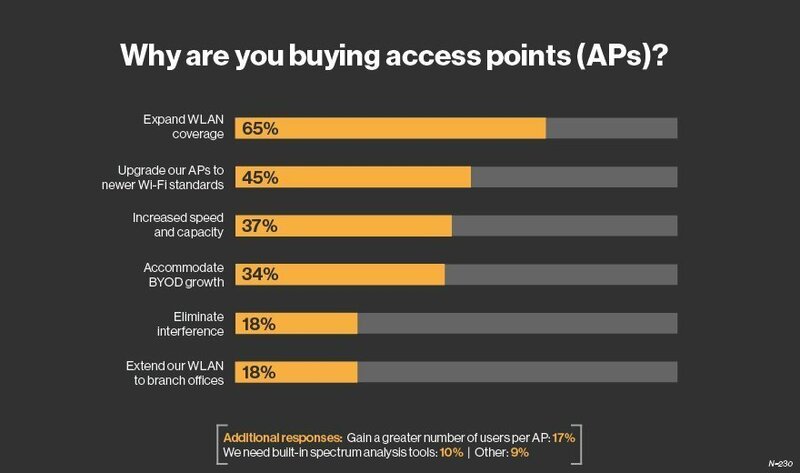 Besides WLAN coverage, tech buyers are purchasing APs to upgrade to newer Wi-Fi standards, a driver cited by 45% of survey respondents. "Upgrading to or adding 802.11ac can improve rate-over-range, increase max data rates, reduce RF [radio frequency] interference, and support many more users per AP," said Lisa Phifer, owner of Core Competence, in an email. Phifer noted that various organizations are now investing in Wave 2 of 802.11ac products. "Some customers are now upgrading to the second wave of 802.11ac access points specifically to increase user density by taking advantage of a new feature called multi-user MIMO [multiple input, multiple output], where a single AP can converse simultaneously with up to four clients." The third-most cited reason to purchase APs, cited by 37% of survey takers, was for increased speed and capacity. "Capacity is 100% an issue that organizations have," Thomas said. What business problems are your customers looking to solve with wireless technology?